The exhibition Enigma brings together recognized Finnish and German artists in a show that kicks off the fall season at Galleri Heike Arndt DK. Finland stands for most of us, for endless woods, high skies and evergreen or white landscapes. Mystical wilderness, and a certain caution towards the unknown comes to mind, recalling images from Finnish filmmakers. Finnish artists do have their very own artistic language based on a closeness to nature, and that thoughtful, melancholy atmosphere. 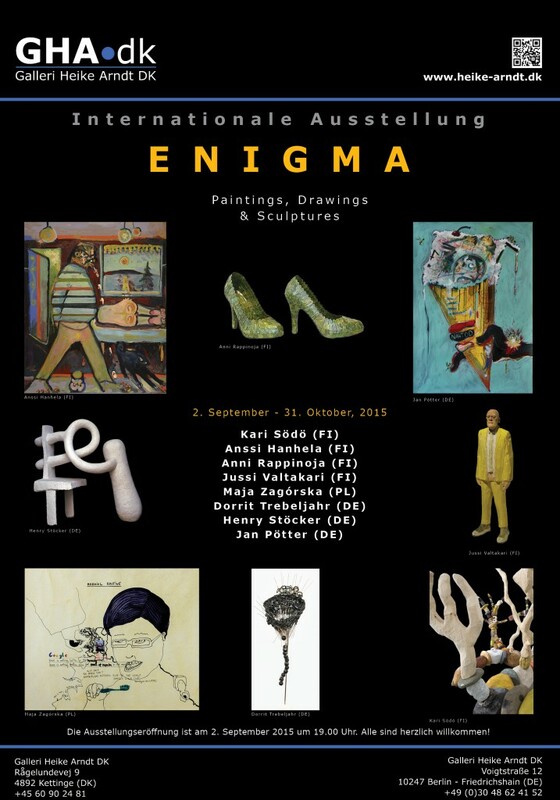 Anssi Hanhela (FI) paintings, Anni Rapinoja (FI) sculptures, Jussi Valtakari (FI) sculptures, and Kari Södö (FI) sculptures, embrace these influences in their works shown in Enigma. In colorful paintings and sculptures they combine stories that explore our inner and outer world, natural materials such as wood, leaves, fibers – even rabbit fur, are used in surprising and playful ways – sometimes combined with a dramatic expression. The German artists chosen for this group show come from completely different backgrounds, landscapes and surroundings, but nevertheless seem to share that basic curiosity for the fundamental questions in life. All these different expressions come together and create a vivid exhibition. The artists share the longing after pureness that nature can offer and focus on basic human needs. In his vibrant, colorful paintings Anssi Hanhela explores the relationships between humans and the mystical reality of nature. There is a certain raw and often melancholic atmosphere in his works, and Hanhela builds up the narrative and stories around the figurative characters. There is a desire to combine the human inner and outer nature – emotions and situations are expressed through thick lines, clear figurations and bright colors. The artistic language used is naive, working with distorted perspectives and straight pencil strokes. The connection with the character of the north is evident in his images – the situations sometimes reminding of scenes from books about the northern region, such as Popular Music from Vittula, in their dark yet humorous expression. Anni Rapinoja’s artworks represent very much the typical northern minimalistic expression. In close relation with nature her works from the Wardrobe of Nature-series use forms from the human world such as fashionable shoes, handbags and hats, made entirely out of natural materials. She finds the her materials in the landscape around her and implements them in beautiful, fragile objects. Rapinoja sees the lingonberries, reeds, deer and rabbits as co-creators of her art. Her works seem to bear references to American land art, in small scale. Rapinoja considers her involvement in the creation of her art a small part of the cycle of nature. Historically people would use what they could find to make clothes or build houses. The shoes, hats and bags of Rapinoja seem wearable and raise questions on the ideas of beauty and consumption in our society. Jussi Valtakari started forming his artistic expression and interest in wood carving from the age of four, making his first toys and figures. Today, this has developed into making fiction portraits. Carving figures out of wood is building on a long standing tradition from ancient times and connects the works of Valtakari with this classic tradition. The figures are often based on his observations of local people, he also gathers images from different forms of media. Valtakari carves from memory and makes a kind of diagnosis of our time in scale models from past and present. At the same time it is almost as if the sculptures observe you, if you look closely they look back at you. Kari Södö graduated from the Kankaanpää School of Art in 1996. He mainly works with sculptures but he is as well a superb graphic artist. He uses nature as his very own playground and creates fantastic wooden sculptures. The artistic language in the labor intensive works is abstract and minimalistic. The bright colors and shapes bring us back to our childhood. The forms seem as though they can be remodeled and put together in an endless variation of constellations.His graphic pieces are very much related to his sculptures – minimalistic but still reminding of a beautiful autumn day – the same colors and shapes can be found. Jan Pötter is a Berlin-based artist who creates colorful mixed-media pieces. Through symbolic motifs he explores the conflicts and catastrophes of our modern western society. There are clear references to art brut, a movement started in the late 1940’s by painter Jean Dubuffet celebrating art outside of the conventional rules of the art world – such as graffiti – the naive, raw and innocent. Basquiat was another painter who with his roots in the street scene and graffiti can be associated with this form of art. The reference to art brut can be seen in Pötter’s expressive, almost aggressive, lines, colors as well as the sometimes naivistic symbolic language used. Maja Zagórska employs signs and symbols such as quotes, household items and self-portraits in order to comment on the joys and struggles of living in modern society. In her work she illustrates her personal highs, lows, and the attempts she makes to balance this private narrative. Through vivid drawings she shows the sometimes humorous, sometimes embarrassing, trivial, obsessive, or sentimental aspects of daily life. The details in her work are recognizable and often humoristic, paired with areas of color she emphasizes objects or situations we can all relate to. Berlin-based artist and sculptor Dorit Trebeljahr creates delicate and almost lyrical sculptures. According to Trebeljahr the creations do not conform into a specific concept other than that they are all the result of “das Spielen”, the play. The works twist the viewer’s mind by asserting the material with unexpected images and meanings. Her works are poetic, permeated with a playful view on colours, shapes combined with a strong sense of rhythm and repetitive patterns, some of them even move if you touch them. By using quite modest materials in large numbers – such as acupuncture needles or screws – and turning them unrecognizable in completely new shapes and forms, Dorit Trebeljahr succeeds in creating filigree,striking and often surprising sculptures. With a background in biology, sculptor and visual artist Henry Stöcker is fascinated by the structures and shapes of the human physiology and nature. His sculptures bare references to biomorphic images and the three-dimensional metal or plaster forms are presented both as wall pieces and floor installations. The sculptures and drawings, take their starting point in a dialogue between the organic form and the artistic expression, leaving us constantly looking in faith to be able to recognize something. Stöcker’s art reflects his interest in reshaping imaginary perspectives. Reduced to a minimum of necessary material, these works convey both joy and humour and let spatial images surprisingly arise in our consciousness, never losing their grace. It is with a direct and playful language Stöcker invites the spectators to explore a world of imagination.